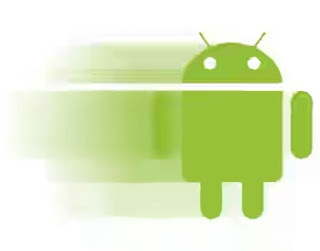 Android phones are snappy and quick but this changes with time and eventually users notice their devices slowing down. Because Android devices handle a large amount of services therefore our Android device get slowed down with time and usage. 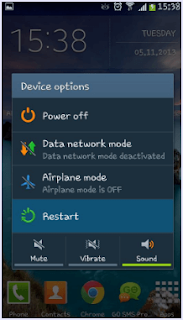 There are many reasons for Android device to slow down including small size of RAM, Multitasking, Cache memory full, Apps clash with each other and Apps compatibility issue, virus and bugs and hardware issues etc. 1. Uninsall Rarely Used Apps. Google Play Store is full of android apps and games. Most of these apps are very functional and the games are great. Thus, users are tempted to install many of these apps to ad more and more features on their phones. But, there is a huge downside to it. Installing a large number of apps slows down the device. This is due to the fact that all these apps have background services which continuously run and tend to slow the device. Hence, it is advice to install only the apps that you use the most and are must have for you. 2. Disable Screen Animation And Dynamic Wallpapers. 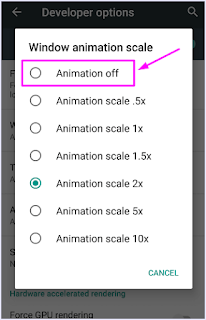 Another way to make android faster and increase your device performance is to disable screen animations and dynamic wallpapers. Animation and dynamic wallpapers slow down the speed of menu sliding and touch effects. 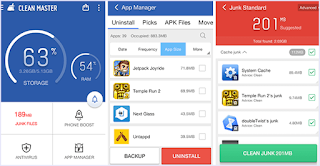 If you want to install custom launchers then you should install according to your device compatibility that should not effect your processing speed. 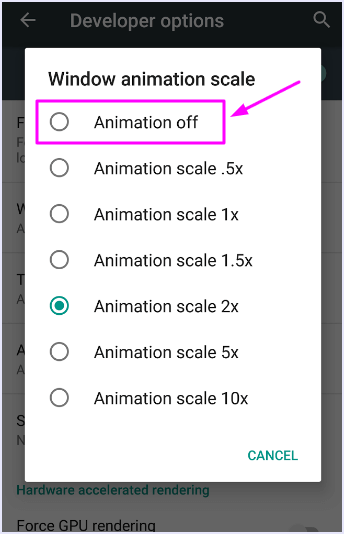 To disable animations, ether go to “Settings >> Display” or “Developer Options” on your device. 3. Avoid RAM Management Apps. The Play Store is full of RAM management apps and junk cleaners. Most users install these apps on their phones hoping to see an increase in performance of their device. But, these apps are a nightmare and slow down the phone even further. They start background services like app lock and on screen cleaning shortcuts which consume a lot of RAM as well as processing power. Hence, we recommend you to manually clear your RAM instead of using such malicious apps and helps to make android speed faster. 4. 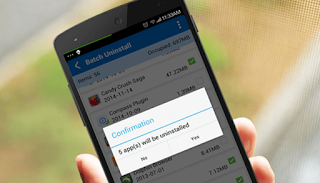 Clear Your Apps Cache Memory. 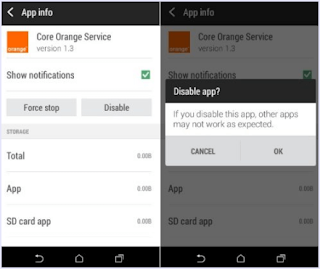 Android devices also slow down when your phone cache memory is filled by Apps data. Cache memory contain those files and images which are required by Apps at the time of starting. Cache will improve your device speed by reducing the number of ROM memory access. Sometimes our phone cache memory is filled by Applications which are not used. So we have to clear cache memory in order to get our phone speed back. We can clear cache by settings >> storage >> cached data. 5. Free Up Some Space. Most of the times, android phones slow down due to full or almost full storage space. You should always keep enough empty space in your storage so your phone can perform properly. Check your storage by heading to ” Settings >> Storage”. Delete the unused files or back them up on a cloud service like Google Photos or DropBox. No matter how good they look on your homescreen and lockscreen, Widgets consume a lot of system resources and RAM. Hence, they slow down system performance. Thus, to speed up your android device, use only the Widgets that you find most useful and get rid of others. This will also help you save battery. One best tip to get the best performance form your android device is to start the day by a quick REBOOT. Rebooting your phone in the morning refreshes every process and kills the unnecessary ones. This helps you get smooth and fact performance from your device throughout the day without any hick ups. All Android developers also recommend doing so and helps to make android faster. 8. Update Your Phone’s Software. Smartphone companies are constantly trying to make your Android experience better and better. Thus, they constantly fix bugs and push updates that smooth your device’s performance and make it snappy and quick. You should update your phone as soon as a software update shows up. These updates also contain Android updates and security patches released by google which are very helpful for both speed and security of your device. Google makes stock Android very light and fast. But manufacturers like Samsung, Mi etc load them with Apps that you can’t uninstall. For example, Your phone may have 2 browsers – chrome and your company’s browser, and even 2 music players. This makes the software heavy and laggy at times. Hence, you can disable the Apps that you don’t use but came installed on your phone out of the box. to disable unnecessary Apps, head to “Settings > Apps > All Apps” then tap on the app and hit “Disable”. 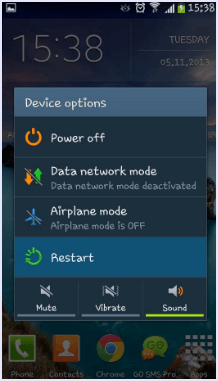 If all the above methods do not work for you, then your can try resetting your device to factory settings. This will delete everything from your device and make it like out of the box. Hence, what ever was slowing your device will be removed and it’s quick and make android faster. Note :- Doing this will remove all your data and Apps. Hence, make sure you have proper backup of all your Data before doing a reset. These are the best ways to speed up and make android faster and user experience back to that of a new device. If your have any query or question regarding this article, please share with us in comments below. We hope this simple guide helps you get the best out of your phone.